When I pack my make up bag for travel it is often hard to choose which brushes to bring. If I'm going on a long trip - like maybe a week home in Virginia where I might be doing some different stuff - I tend to bring an assortment of my favorite brushes. I'll even pack up my whole brush roll. But if I'm only going out for a weekend I tend to be more picky. Often I'll consider what I'll be doing - if I'm camping, nah, I'm probably bringing zero make up, if I'm going to a family function I might bring some more full coverage stuff, if it is a casual trip weekend maybe I'll bring some BB Cream and a few little things but nothing crazy. But when it comes to brushes for smaller trips, I've paired it down to just the essentials. 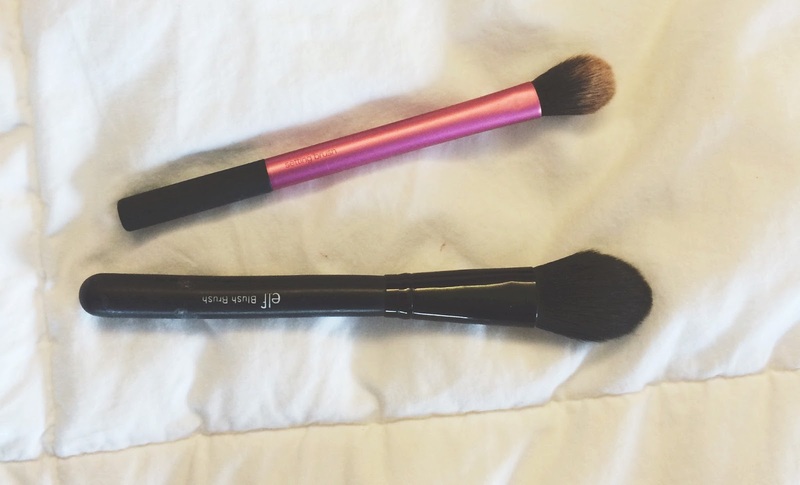 from right to left: Real Techniques Blush Brush, Contour/Bronzer Brush/Real Techniques Powder Brush. Real Techniques Blush Brush - This is my favorite brush for blush and I us it everytime I use blush. Every. Single. Time. Contour/Bronzer Brush - This brush is from a set on Amazon that I highly recommend. I love this brush for bronzing and contouring because it is fluffy enough to blend but small enough to be precise. I don't lay down a heavy contour so I like to have a brush that can blend out in the hollows of my cheek bones. Real Techniques Powder Brush - If I've got a liquid foundation in my make up bag I need a powder brush to set my foundation. I never go with out setting my foundation because I have oily skin and I need it to last as long as possible. 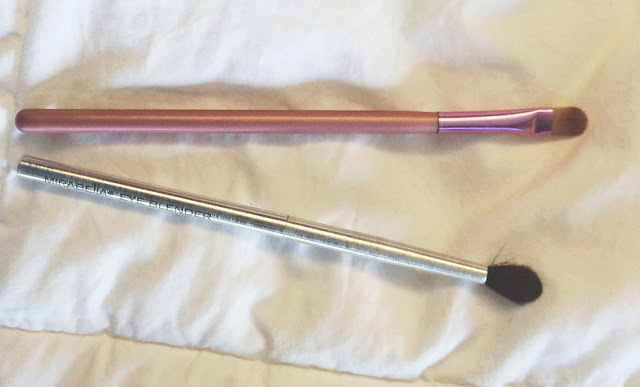 Real Techniques Setting Brush - If I plan on doing some under eye concealing and maybe a bit of highlighting with concealer, this brush is a must. It is small enough to fit under my eye and the bristles are really soft so my endereye doesn't feel tortured! Flat Shader Brush - This brush is good for packing on the color to your lid and being precise in the inner corner or outer corner. Because it is so dense, I find it to be a really functional brush. Blending Brush - Because when I travel I am usually not going to do an intense eye look, I make sure to bring just one little blending brush. This one happens to be from Mirabella and is just a simple fluffy brush. I use this in the crease and to blend everything together. Nothing fancy, just simple. These also happen to be the brushes I grab for in a hurry. If I'm just doing a simple look or just an everyday look I know these can be my go to brushes. I also have a video on my channel about my favorite ELF brushes but I am thinking about doing an update video because there are so many more brushes added to the collection now! What are your travel make up essentials? I loooove my real techniques brushes! The powder brush is great. I even like the foundation brush. I think they came together in a set.